Free shipping. Buy direct from HP. 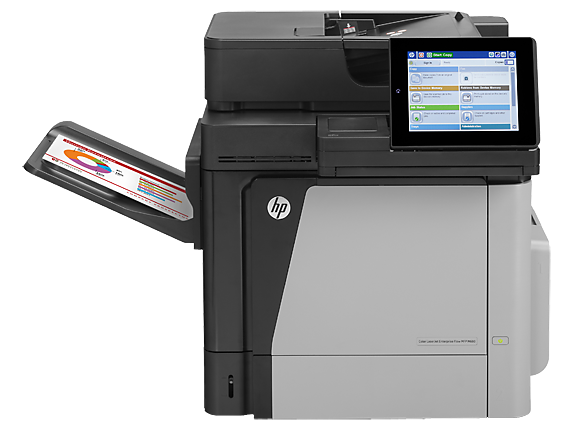 See customer reviews and comparisons for the HP Color LaserJet Enterprise MFP M680dn. Upgrades and savings on select products. Print without wires—or a network. Get easy access to the MFP through optional wireless direct printing. Mobile printing at a touch—enable touch-to-print convenience from mobile devices. Easily print from smartphones, tablets, and notebooks at work, home, or on the go; Mopria-certified. Pull print jobs from your pocket—walk up and print or scan from your USB drive. Depend on an MFP that can expand with your business, whenever solutions advance.Take the guesswork out of fleet management—centrally monitor and control your MFPs with HP Web Jetadmin. Be confident that sensitive business data is protected with advanced security and an encrypted hard disk. Reload less often—tackle high-volume printing with a paper capacity of up to 3100 sheets. Reduce employee time at the MFP, using the automatic document feeder.Get exceptional value from Original HP high-capacity ink cartridges.Save time with automatic job sorting and finishing, using the optional 3-bin stapling mailbox. Get more done, faster. Scan two-sided documents in a single pass. 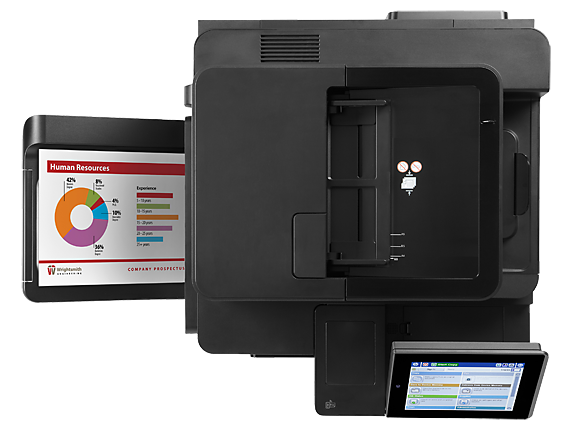 No missed pages, no flipping pages by hand.Preview and edit scans, adjust images, and launch standard processes—all at the 8-inch color touchscreen.Reload less often—tackle high-volume print jobs with a paper capacity of up to 3100 sheets.Scan and send digital files directly to email, network folders, or the cloud. Print without wires—or a network. Get easy access to the MFP through optional wireless direct printing.Mobile printing at a touch—enable touch-to-print convenience from mobile devices.Easily print from smartphones, tablets, and notebooks at work, home, or on the go; Mopria-certified.Pull print jobs from your pocket—walk up and print or scan from your USB drive. 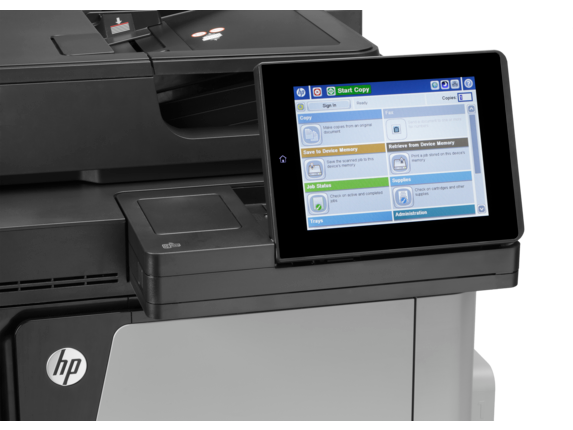 Depend on an MFP that can expand with your business, whenever solutions advance.Take the guesswork out of fleet management—centrally monitor and control your MFPs with HP Web Jetadmin.Be confident that sensitive business data is protected with advanced security and an encrypted hard disk. 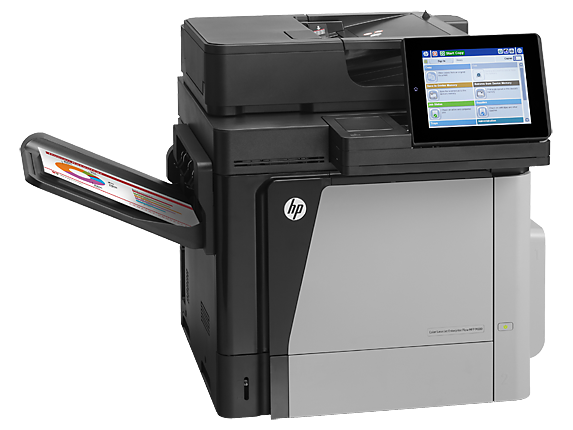 Reload less often—tackle high-volume printing with a paper capacity of up to 3100 sheets.Reduce employee time at the MFP, using the automatic document feeder.Get exceptional value from Original HP high-capacity ink cartridges.Save time with automatic job sorting and finishing, using the optional 3-bin stapling mailbox. 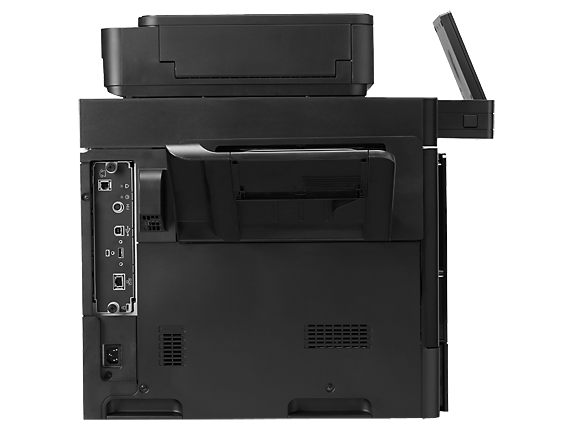 1 Local printing requires mobile device and printer to be on the same wireless network or have a direct wireless connection. Wireless performance is dependent on physical environment and distance from access point. Wireless operations are compatible with 2.4 GHz operations only. Remote printing requires an Internet connection to an HP web-connected printer. App or software and HP ePrint account registration may also be required. Wireless broadband use requires separately purchased service contract for mobile devices. Check with service provider for coverage and availability in your area. Seehp.com/go/businessmobileprinting for more details. Mopria-certified devices adhere to a common standard that enables easy mobile printing with little or no setup. 2 Scanning to SharePoint and/or the cloud requires an Internet connection to the printer. Services may require registration. Availability varies by country, language, and agreements. For details, see http://www.hp.com/go/mfp 3 Maximum paper capacity requires purchase of additional paper trays for the HP LaserJet Enterprise M680f and M680dn. 4 Wireless direct printing requires purchase of optional module. Mobile device may require an app or driver. Wireless performance is dependent on physical environment and distance from the printer. For details, see http://www.hp.com/go/businessmobileprinting 5 Touch-to-print capability requires purchase of optional module. Mobile device must support near-field communications–enabled printing. For a list of supported devices, see http://www.hp.com/go/businessmobileprinting 6 HP Web Jetadmin is free and available for download at http://www.hp.com/go/webjetadmin 7 Three-bin stapling mailbox requires additional purchase for the HP Color LaserJet Enterprise MFP M680dn and HP Color LaserJet Enterprise MFP M680f. 8 Fax functionality not available on the HP Color LaserJet Enterprise MFP M680dn. 9 Keyboard is available on the HP Color LaserJet Enterprise MFP M680z only. 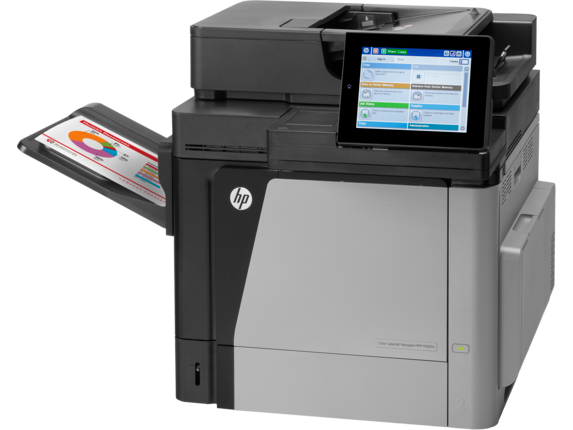 10 HP EveryPage is available on the HP Color LaserJet Enterprise MFP M680z only. 11 An FCC Class A emissions compliant device meets the less stringent (higher) levels of emissions allowed by the FCC for a product operation in a commercial environment. An FCC class A device cannot be marketed for use in a residential environment and an FCC class A device should not be purchased for use in a residential environment due to the increased risk of interference to radio communications.